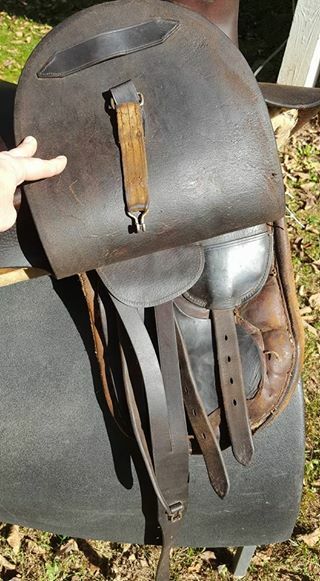 Seat Length - Each saddle is measured for length both from the front of the upright pommel to cantle (US method), and the cutback to cantle (UK method), so it will look like this --> 21.5"/17.5". You should have 3-4 fingers width behind you in a saddle. A shorter thigh will take a 19-20.5"/15-16.5" saddle; an average length thigh will take a 21-22"/17-18" saddle; a long/full thigh will take a 22.5-24"/18-19.5" saddle. You can usually ride in a saddle that is slightly long, but you should never ride in a saddle that is too short for you. Seat Width - This is taken at the widest point (on average, a girl's saddle is 10-11", a petite lady is a 12-12.5", an average-sized lady is 13-13.5", and a fuller-sized lady takes a 14-15" width). Horse Fit - Gullet (tree) width from front d-ring to d-ring, and the width of the points (shoulder width). Please check your leg length and your horse's measurements against those given to have a general idea if a specific saddle will work for you. If you have a withers tracing, please send it to us, as this will allow us to more accurately check the saddle against your horse's shape for fit. TRIAL POLICY - Our standard trial is 3 days from date of delivery, unless a consignor has specified otherwise or other arrangements have been made. 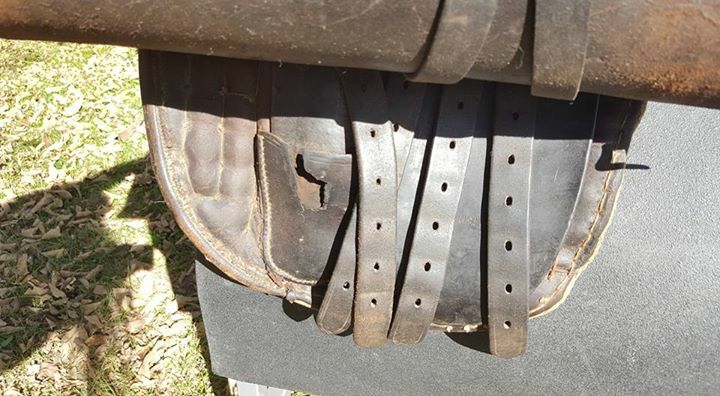 All saddles must be paid for in full prior to the trial, and a trial agreement signed. Please contact us if you are interested in a trial on a saddle. PAYMENT - We accept cash, check, and credit cards through PayPal (3% fee applies). 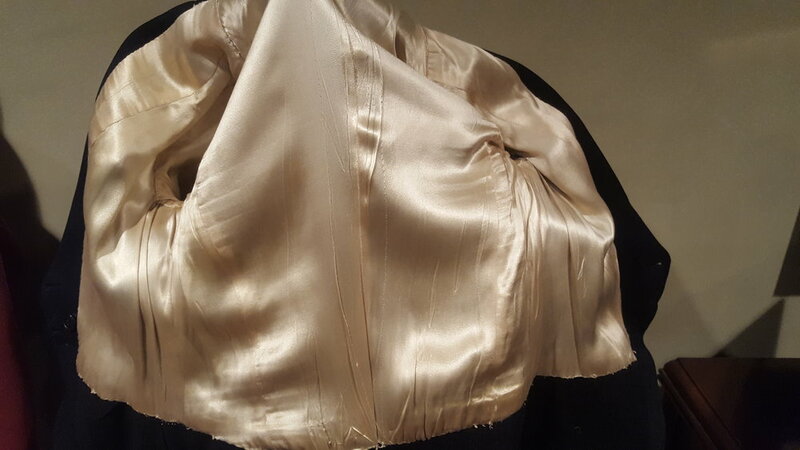 See the consignment page for other information. Owen, 20.25"/16" x 13". Gorgeous Owen, in excellent show condition. Features wide pommels, doeskin seat and pommels, and new front d's. It has a hard to find WIDE tree, with 9" between the d's and 17" between the points - this saddles fits the challenging flat withered ponies, cobs, and horses. Price is firm. $3,850. Off market - Currently being leased. Mayhew-style side saddle 21.5"/17.25" x 13.5". Mayhew-style side saddle, no stamp other than "England." 1900s era. Single position leaping head, all leather, wide pommels, mostly serge panels. Panels are mouse-chewn, so would recommend replacing them. Medium tree. Leather a bit worn on upper pommel. Needs point pocket repair. No fittings. $950. Champion & Wilton side saddle, 21"/16.75" x 12.5". 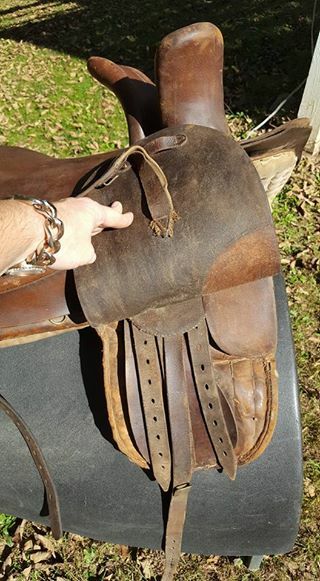 This all-leather saddle is in very good overall condition. It is 9" between the d-rings and 17" between the points, so a medium-wide tree. It is outside girthing, and has a linen bottom. It needs some slight repairs to the serge where a mouse chewed on it, but it is a minor fix. There are a few cosmetic dings on the seat, and two holes and a mark where a previous owner had a nameplate. $2,000. Champion & Wilton side saddle, 20.5"/16" x 12.5". This lovely little saddle has a doeskin seat, wide leather pommels, and a serge bottom. Overall it is in very good condition. It is 9.5" between the d-rings and 17" between the points, so a MW to wide tree. $2,250. Champion & Wilton side saddle, 21.5"/17" x 13". This all-leather saddle is ready to go! It has been well-used, but has many more years left in it. It has had a small repair to the front of the offside seat at the cutaway and the cantle. It has two small holes in the seat (cosmetic only), and needs a new offside front d-ring and back d-ring. 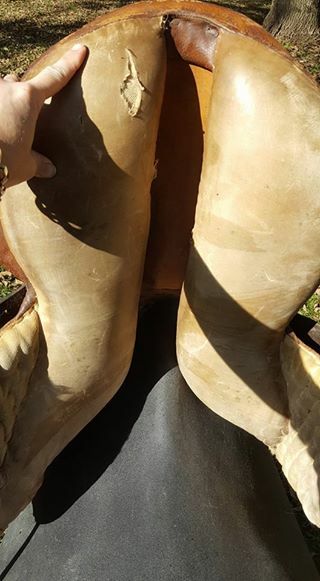 It does have a tight curve to the leaping head, but that can be bent out by a farrier. It is 8" between the d-rings and 15" between the points, so a firm medium tree for a narrower horse. Comes complete with a balance girth and stirrup and fitting. $1,650. 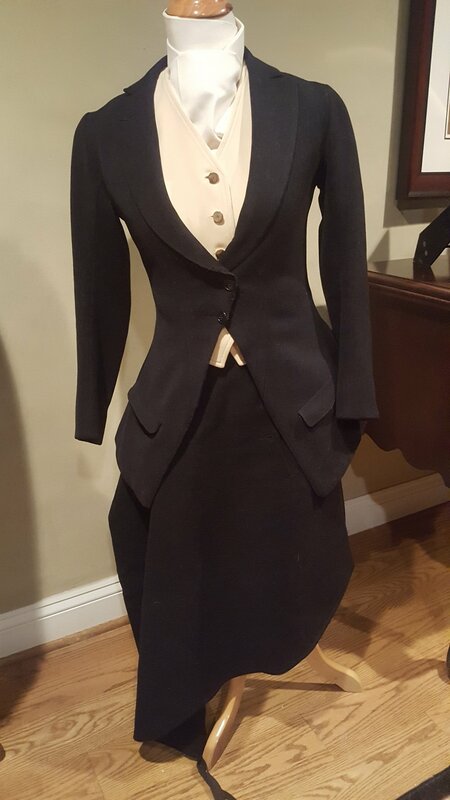 Jacket: bust 35" (so fits a 32-33"); waist 30"; sleeves 21.5"; back length 16.5"
Apron: waist 32.5"; buttons currently set at 28.5"; left length 21.75"; knee 17"; knee to right toe 17.25"; bum wrap 10.5"
Jacket: Bust 38" (so fits a 35-36"); waist 30"; sleeves 26"; back length 25"
Apron: waist 33.5" (buttons currently set at 30.5"); left side length 26.5"; waist to knee 15"; knee to right toe 26"; bum wrap 11.5"
Approx sz 8 US. Stunning, show condition, vintage English side saddle habit. 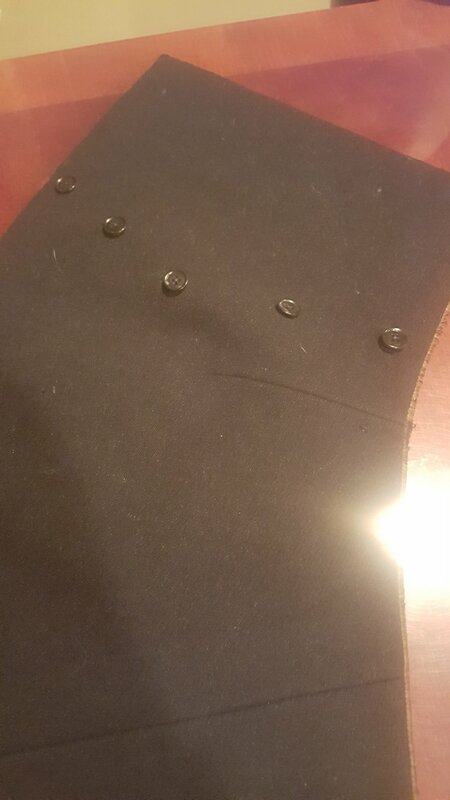 Dark navy cavalry twill. The maker's tag was removed when the jacket was relined, but appears to be a Bernard Weatherill. No wear anywhere. 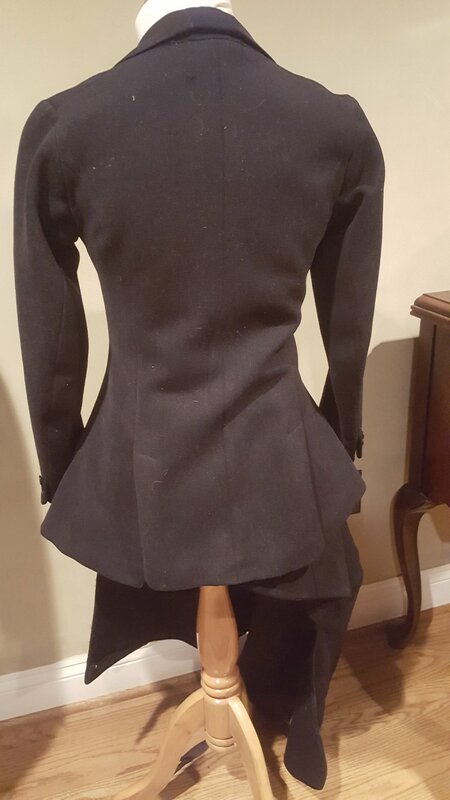 Jacket is single-button, slanted front, double vented back, notched collar. Apron has a pocket. $875. Apron - waist 30"/buttons currently set at 28"; knee 16"; length 27.5" (but has a deep 4" hem, so it can be lengthened to 30") wraparound length 10.25". This page is currently being edited. Please check back for updates!